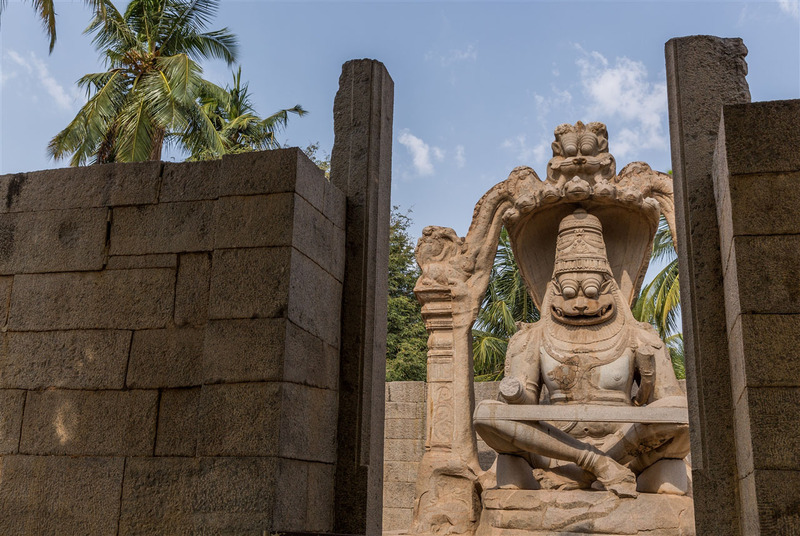 A little southwest of the Krishna Temple in a pavilion just off the main road is perhaps Hampi’s best known sculpture – the extraordinary Narasimha Monolith, also known as the Lakshmi Narasimha Temple. 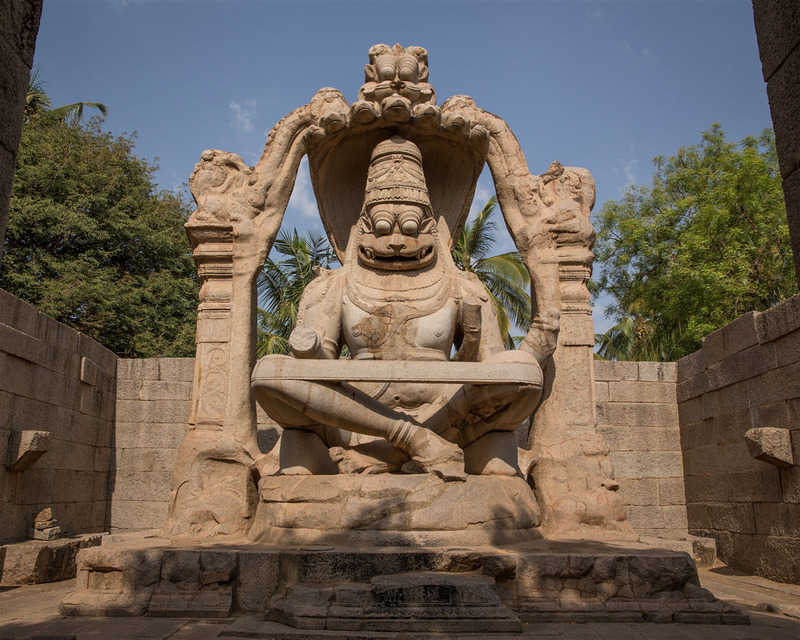 This is a magnificent figure of Vishnu in his Narasimha form (half man, half lion), the fourth incarnation of the god of preservation, seated in a yogic posture and wonderfully carved out of single granite rock with almost cartoon like popping-out eyes. 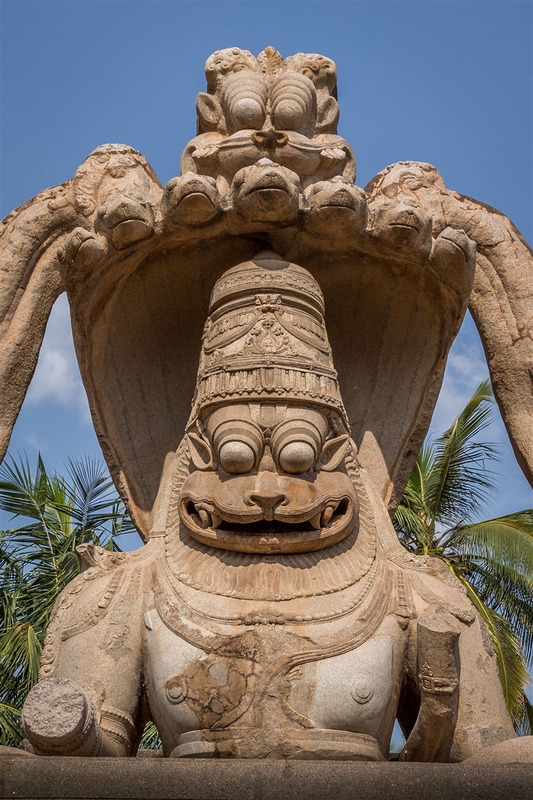 Rising over the head of the deity is a multi-headed cobra hood surmounted by a yali, which forms an arch supporting the two free standing columns. This 6.7m high sculpture, built in 1528 and the largest in Hampi, has been restored after many years of serious weathering. The band of stone that stretches between the knees is new, and you can also spot other traces of newer stone set against the darker original carving. Sometimes restoration can go a little too far or be unsympathetically done, but here I think they’ve done a great job. It’s an imposing figure, with the walled enclosure concealing what lies within until the very last seconds of your approach, it only serves to magnify the impact it has on you. There used to be an additional figure of Lakshmi, Vishnu’s consort, positioned on Narasimha’s lap. This was seriously damaged during a raid in 1565 leading to the fall of Vijayanagara (Hampi). If you get a chance to go inside the enclosure (I didn’t, a low iron barrier implied to me that this was not to be done), you can apparently see the goddess’s hand resting on the back of Vishnu in an embracing posture. 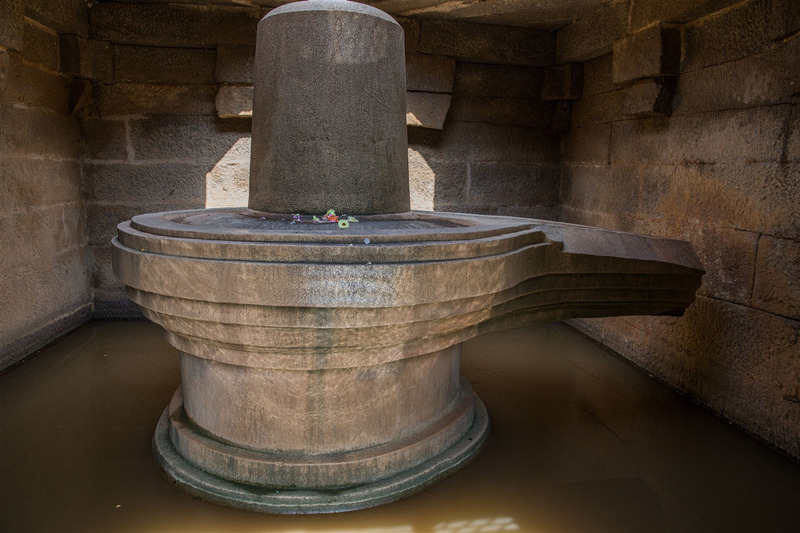 Immediately next to the monolith is a 3m tall Shiva lingam, called the Badavilinga Temple. Legend has it that an impoverished woman commissioned the construction to prove her devotion to Shiva. In the local language “bada” means “poor”. The lingham also has Shiva’s three eyes carved on it, and sits in a semi-covered chamber that’s always submerged in water. This water is channeled from the Tungabhadra river 1km away. The best time to visit the Narasimha Monolith for photography is in the morning to early afternoon. Later in the day the sun is behind the figure. This completes my mini photo tour of the central-southern area of the sacred centre of Hampi. Next I move on to the eastern extent and the amazing Vitthala Temple, and then the monuments that follow the route of the Tungabhadra river back to the heart of the Hampi’s sacred centre. Outstation Clicks & Description ……!!!! !